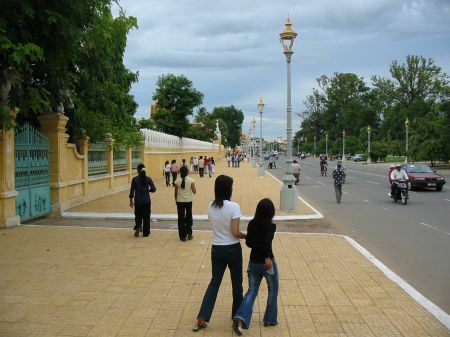 After I have been traveling for previous weekends I though it would be a good idea to explore Phnom Penh for a change. After all, I live and work here and get to see the city mostly on my way to work or work related appointments. Moreover, it is seven days from today to national election and I thought it would be a good idea to catch the mood on the streets of the capitol. I met a moto driver the other day who spoke quite good English and seemed to know the city pretty well. I planned to call him yesterday evening. Unfortunately I left all the name cards I collected so far in the office and his number was written on one of them. So I went to one of the Khmer restaurants to have breakfast. And read the weekend issue of the newspapers. I kind of enjoy the luxury that there are only very few newspaper in English. So most of the time I manage to read through each issue. This is an easy way to know what all the other foreigners read. 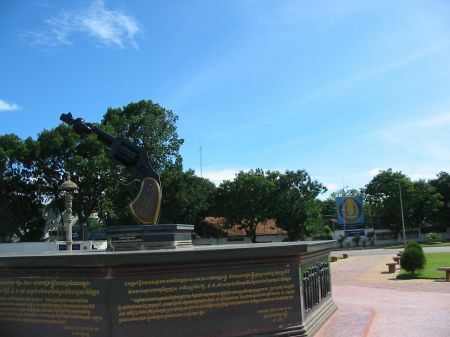 There was an article about Rattanakiri in the weekend editions of both the Cambodia Daily and the Phnom Penh Post. I do not expect to find them online and might type them in case I find enough time. It was almost noon when I decided to call the UNDP driver again. He had time and was willing to facilitate my plans. 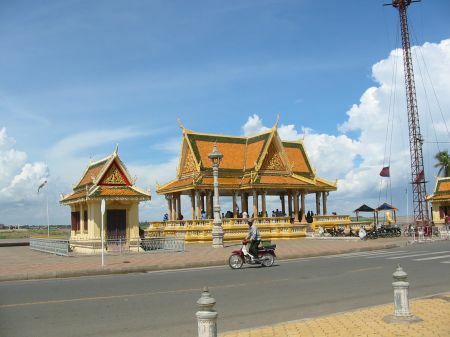 So we went to riverside first, which is maybe the touristiest place in Phnom Penh. 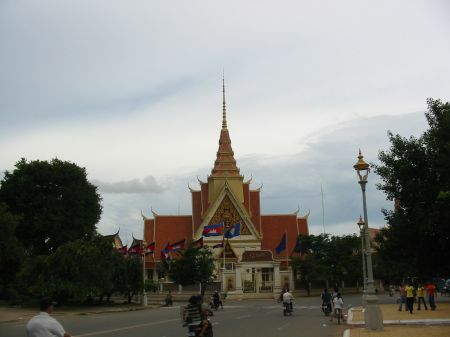 Not least because this is where the royal palace is. 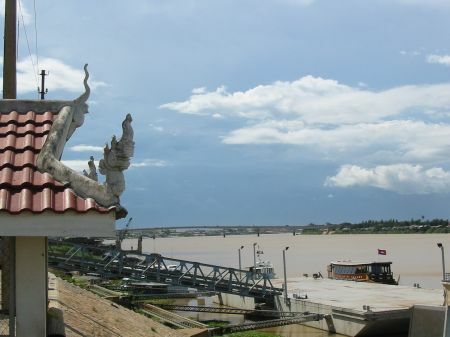 This is opposite from the royal palace, directly at the Mekong River. Tourists as well as locals hang out here. The ship in the background is the Naga Casino. 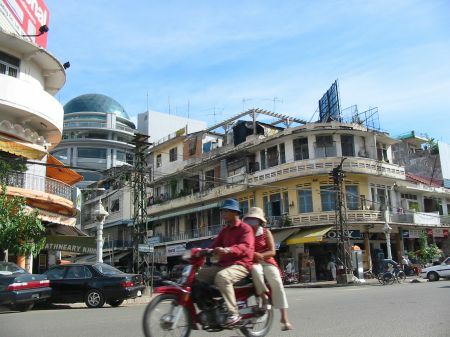 There is actually a 100 km ban for casinos around Phnom Penh. This was issued after 1995 when a massive casino boom occurred in Cambodia. However, most likely due to the breathtaking corruption this major casino is operating. 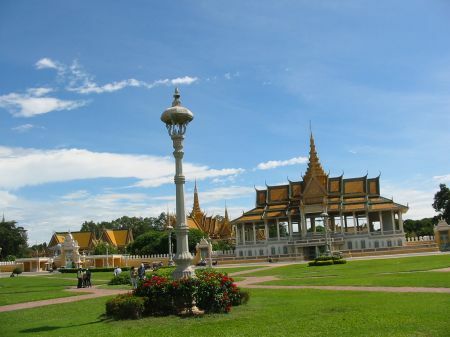 In the background to the left is the roof of the royal palace. 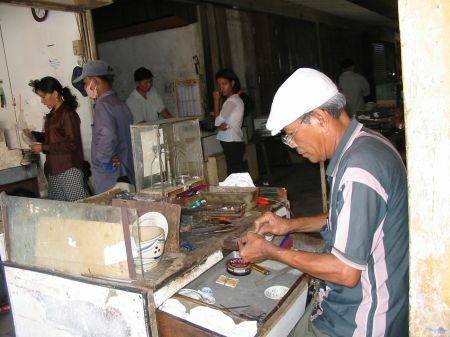 People come to this place to â€œpray for better businessâ€� as my guide noted ironically. 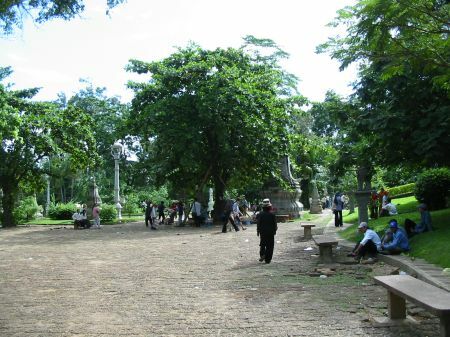 This is the compound of the royal palace. Initially I wanted to travel part of the way to Rattanakiri by boat. So we went to the port to find out about it. We learned that there are no boats to Kratie (halfway to Rattanakiri) because there are too few tourists to make it profitable right now. 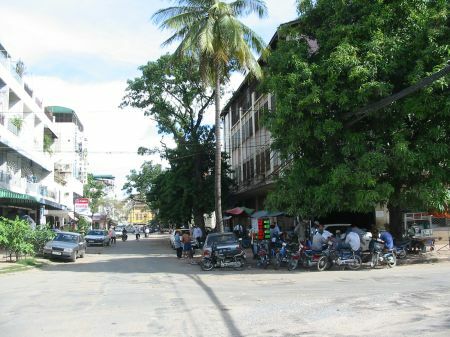 So I decided to travel with a minibus to Kratie for about 10$ per person. In the background is the important Japanese bridge. 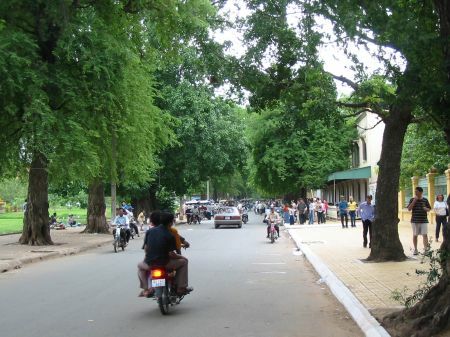 This is Wat Phnom in the north of the city. 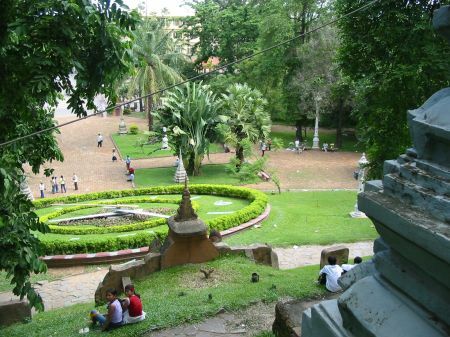 This is what gave Phnom Penh its name and is located on a hill. 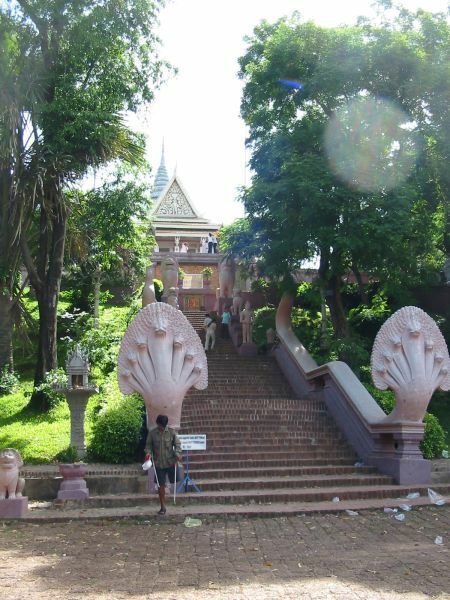 Supposedly both the hill and the Wat has been created in 1372. 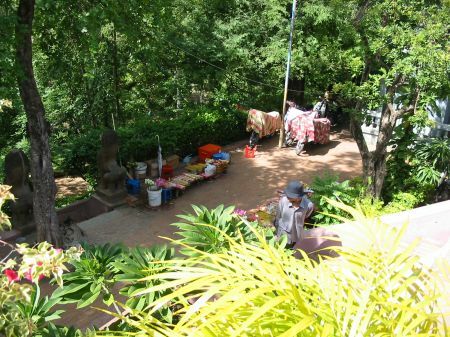 Mr. Penh found four Buddha statues and erected this hill together with friends to provide an appropriate context for the statues. My tourist guide notes that this place is integrated into the live of the population and many people come here particularly on weekends. Supposedly there was a rock concert organized by the CPP attracting about 10.000 people on Saturday around here. This is what I read in the newspaper on Monday. However, I did not see any indication that there was such a major event only a few hours ago. This is early afternoon and the place is not particularly busy. At this place people sell incense. These guys were playing cards. 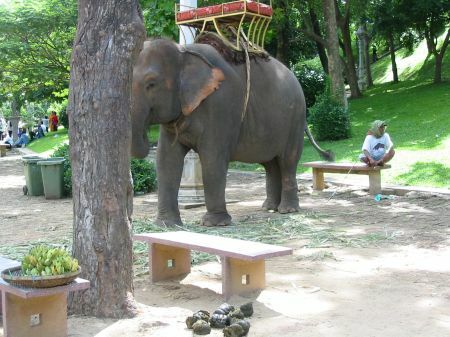 It seems nobody wants to ride on the elephant ride now. Then we continued our journey. I thought it would be good to have some sort of before/after pictures. So we went to the headquarter of Funcinpec. There are only three big parties: CPP, Funcinpec and Sam Rainsy. 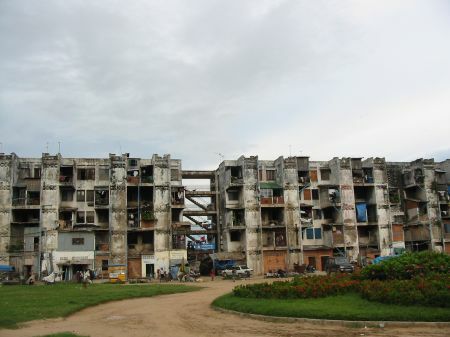 Recent governments have always involved prime minister Hun Senâ€™s party CPP. Currently there is a coalition with Funcinpec. Those are the royalists. Recently they started to distance themselves from CPP. 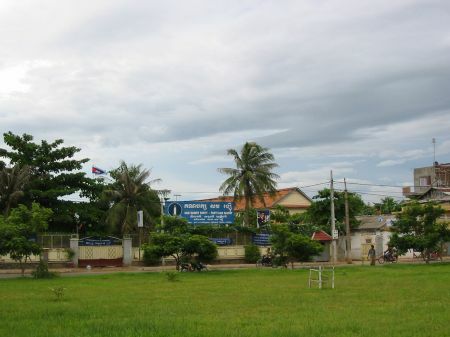 In the background is Funcinpecâ€™s headquarter. In front of it in the middle of this traffic circle is this obscure monument. This is a revolver with a knot in its barrel. This is their gate. The Funcinpec logo involves the shape of an Angkor Wat like temple and the face of their leader Prince Norodom Ranariddh. The building in the right half of the picture is part of the generous compound of the French embassy. 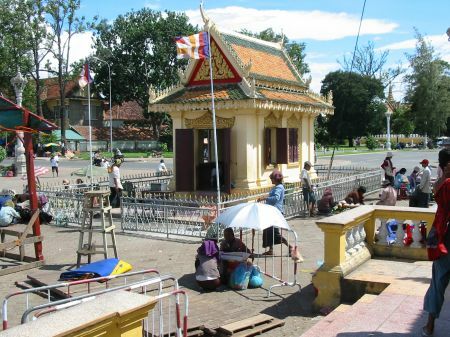 Reminder: Cambodia was a French colony. This is neighboring Funcinpec partyâ€™s headquarter. 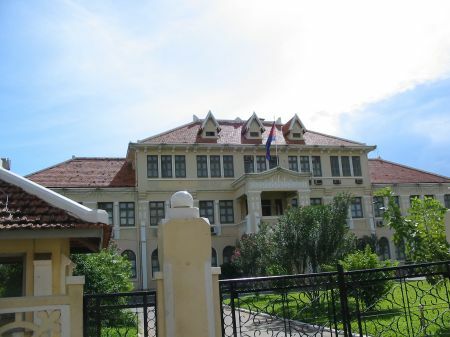 This is the residence of the governor of Phnom Penh. 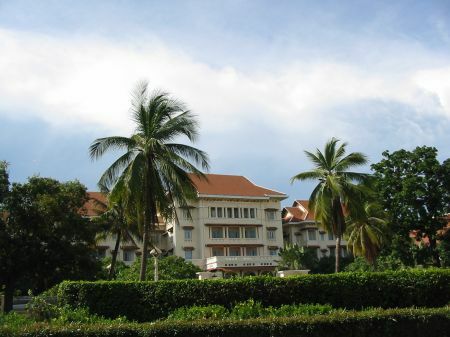 This is the Hotel de Royal, one of the oldest and finest hotels in town. 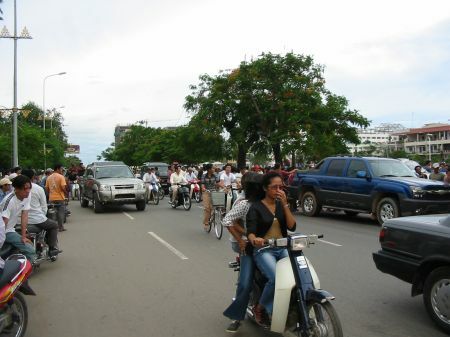 The group of moto drivers is a very characteristic sight image in Phnom Penh. 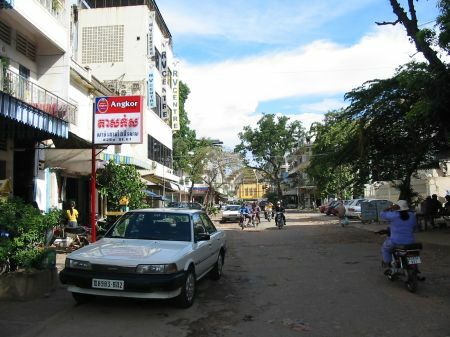 This is the area of the central market. 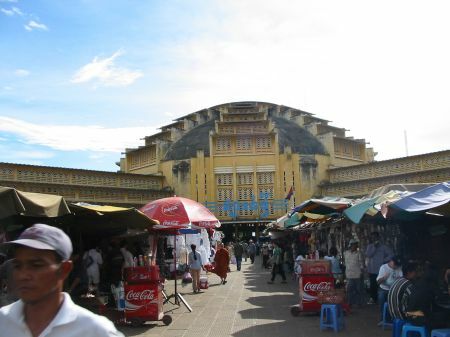 The yellow building down this road is part of the central market hall, which is an architectural highlight and landmark in Phnom Penh. This is the railway station. The area offers strong contrasts. 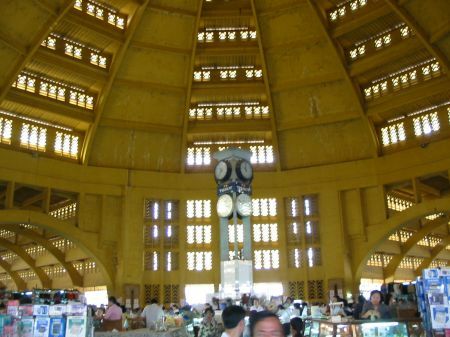 This is inside the main hall in the central market building. This is the main entrance. 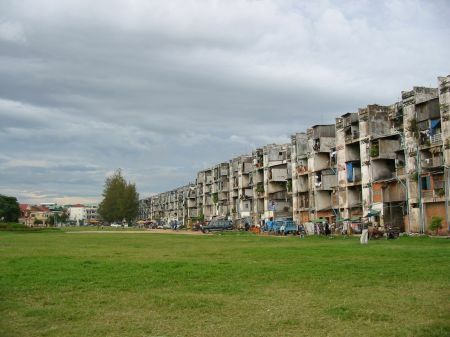 This is the headquarter of Sam Rainsy Party. 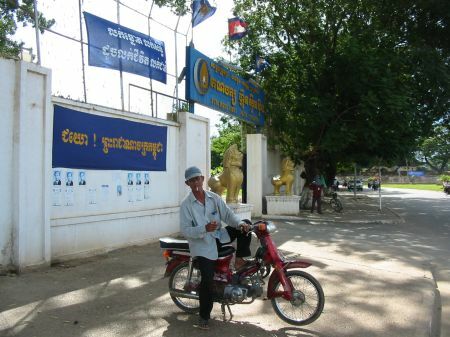 Sam Rainsy is the big opposition party and does not currently participate in the government. 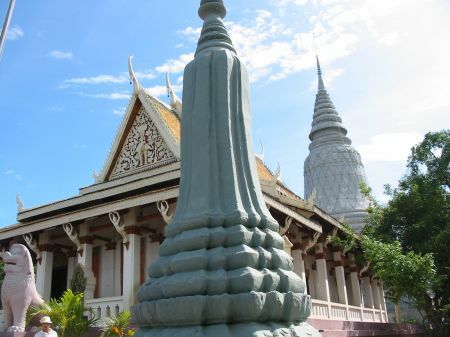 However, recently prime minister Hun Sen has moved in the direction of Sam Rainsy party and considers a coalition with this party a possibility. Their logo involves a candle and the head of their leader Sam Rainsy. The society is extremely politicized along party lines. This is not so much a matter of programs but a matter of persons. 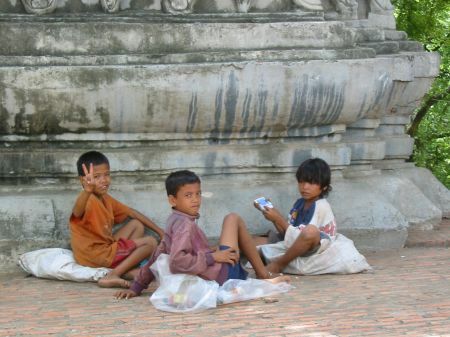 Programs do not work well where the literacy and poverty rates are as high as in Cambodia. This is the opposite side of the street. 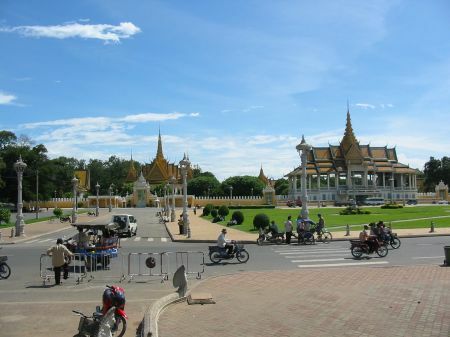 This is again in front of the royal palace. 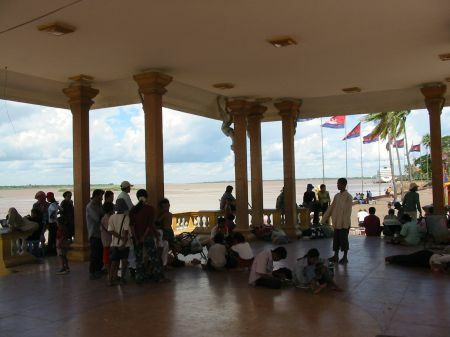 This is where the Cambodian Parliament meets. This is very close to the royal palace and rather modest in its size when compared to it. I read the next day on the front page of the Cambodian Daily that there was a political demonstration staged by CPP on the same day. Supposedly about 200 demonstrators shouted â€œSam Rainsy is a failureâ€� and burned t-shirts bearing the opposition party logo. According to the newspaper, one of the demonstrators asked whether he can keep his shirt. This is one of the neighboring streets which appear to be very busy. 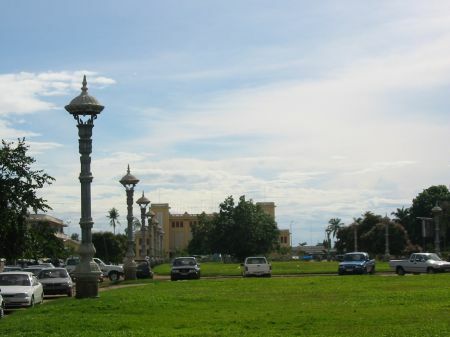 This is a square along Sothearos Boulevard. 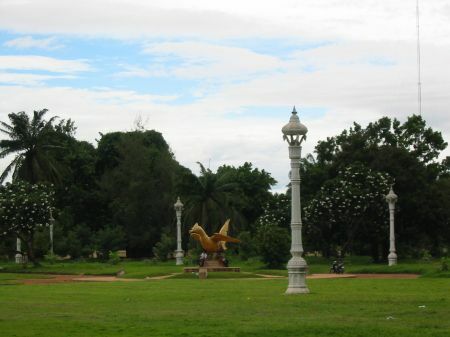 This is on Sihanouk Boulevard close to where I live. There has been an accident involving the back of the huge American car to the right and the front of another 4 wheel vehicle in the backgrounds (not the silver Nissan). While the massive American car did not show much impact, both of the other carâ€™s airbags were open and the entire car appeared to be significantly shorter than it is supposed to be. 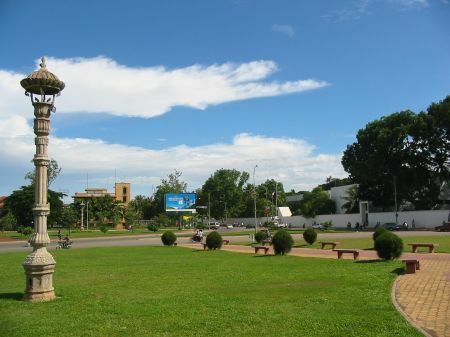 This is almost in front of where prime minister Hun Sen and other rich and powerful people live, close to the Monument of Independence. I do not think anybody got hurt.